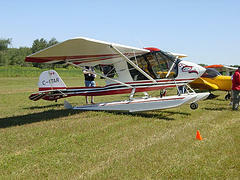 The huge advantages of ultralights is even greater when the amphibious ultralight is added to the picture. For the hobbyist, the passionate, the recreationist, the sports flier, the business person and so many more people worldwide, the amphibious ability of the ultralight airplane broadens the scope of "where to go" places. Some are even fitted with skis for snow landings and take-offs. Talk about versatile. As you will see these great little aircraft come in many different shapes and sizes which is a good thing. The ability to purchase an ultralight aircraft with or without airplane financing is also a whole lot easier than purchasing practically any other type of aircraft. Keep reading as we talk about ultralights for sale. In life generally speaking when people are seeking to purchase something (particularly when a lot of money is involved) they want quality. This particular company has been around since 1983 therefore has a proven (I suppose I can't say track record) Air record both for safety and reliability. Good to know when it comes to flying. 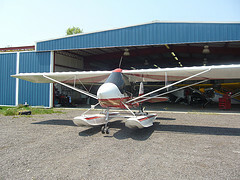 The ultralights they manufacture whether floats, skis and/or wheels can be purchased as ultralight kits, ready to fly or pre-owned and loved airplanes. These aircraft are the first preference for the professionals, the passionate amateurs and the newbies. In 2006 the President and designer of these breathtaking ultralight aircraft, Dave Goulet was awarded the John Moody Award from the United States Ultralight Association. This award is based on his amazing success to the Ultralight Industry as a whole. Why buy Challenger ultralight aircraft? Let's face it, no company stays around for approx. 25 years without making some kind of name for itself. Challenger ultralight aircraft have proven themselves repeatedly, time and time again. With well over 3000 Challenger ultralights purchased either as ultralight kits or ready made and ready to fly, Challenger continue to turn heads when it comes to flying ultralights. Go ahead and click on the above link and discover for yourself all the facts and the reasons why so many people are interested in the Challenger ultralights for sale. You just have to love the fact that at any time you are able to jump into your ultralight airplane and fly wherever you can. However do you have the same ability when it comes to landing your ultralight aircraft? There is a company that will supply (and fit if needed) floats that will suit many different models of ultralight so that you can take-off from land and put down in water. Puddlejumper Floats when added to your ultralight aircraft will increase the versatility of your aircraft and allow you to fly your ultralight to more places. 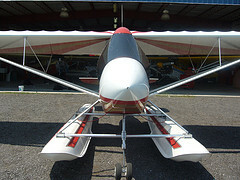 Paddlejumper Floats, an award winner at the 2007 Sun & Fun airshow at Lakeland, Florida have a large variety of amphibious ultralight floats. Click below for more details. 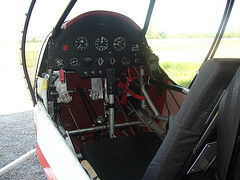 Last flight from Amphibious Ultralight to Airplane and Aircraft home page.